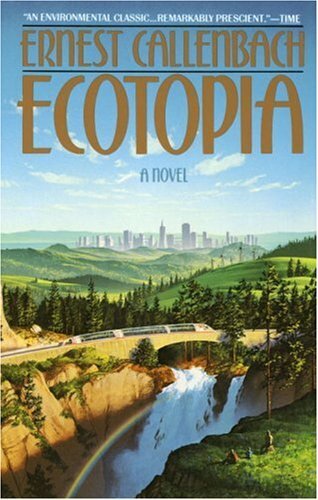 The story as told by a reporter from the remaining United States visiting Ecotopia -- the seceded northwest bio-region of Northern California, Oregon, and Washington -- after 20 years of isolationism. His objective skepticism is quickly eroded by this new green world in which respect for living things is the society's primary value. A bit naive. It is like Callenbach paved the way for our current silly belief in green capitalism. The message: We can do everything we do now in more or less the same way, but we can do it differently and sustainably and green. And yet, the longer its been since I've read this, the more it works on me. Things I thought were silly in my youth seem to make more sense as time goes by. I think about this book frequently. And since books that present our almost certainly bleak future as having a possibility of positive change are rare, it is worth reading.